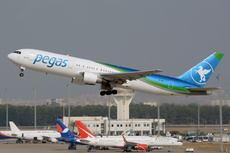 Pegas Fly flight EO454, Boeing 767-300ER (VP-BOZ), contacted a parked Ural Airlines Airbus A321 (VQ-BGY) at Moscow's Zhukovsky Airport in Russia. The Boeing 767 had just landed after a flight from Guangzhou, China and was taxiing to Stand 18 when the left wing tip hit the Airbus A321, parked at Stand 19A. The Boeing 767 sustained damage to the left-hand slat and left-hand wingtip light. The aircraft was repaired resumed service within 24 hours. The Airbus A321 sustained damage to the right hand elevator.